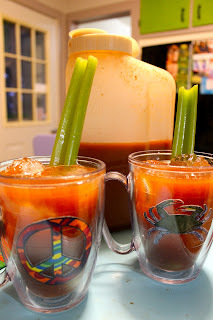 Bossy Italian Wife : Quick Fix: Bloody Mary MIX! 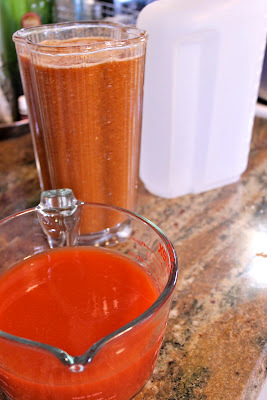 Quick Fix: Bloody Mary MIX! As you all might know by now, I am quite the bloody mary enthusiast. I have been addicted to them ever since the day after my wedding when my father handed me a bloody mary with tequila (known formally as the "bloody maria.") Since that day, I have been on a bloody journey. My goal? To make the best bloody possible. A huge part of this includes making the perfect mix. Now, there are lots of great mixes out there, don't get me wrong. I have tasted some really great ones. But nothing compares for me to the freedom of making my own. So last summer when We Three Canners (that's our canning club consisting of me, my mom, and my mother-in-law) decided to expand our canning operation, I insisted on tomato juice being a part of the expansion. Best. Decision. Ever. So, my base for my bloody mix is my home-canned tomato juice. You can also use V8, organic vegetable juice, or whatever type of tomato juice you enjoy the most. If you can can your own, even better. Either way, this is a recipe that is sure to hit the spot when it comes to a great mix! We've got all the makings of a perfect bloody mix here! 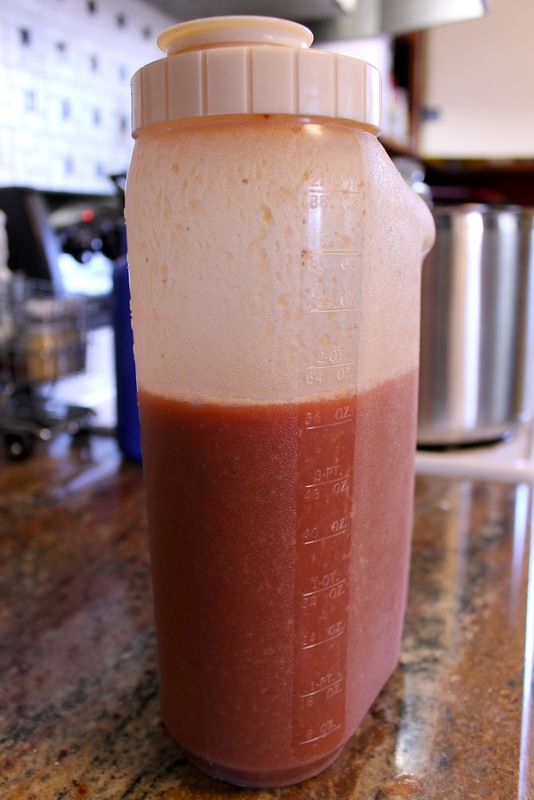 Tomato juice, (of course), worcestershire sauce, extra spicy horseradish, Old Bay seasoning, red pepper flakes, and fresh garlic cloves (my secret weapon), as well as some salt and pepper. Not pictured is my hot sauce, but that is also optional. You are gonna put this allllll in blender. Starting with the garlic. I am using 7 cloves of fresh garlic. It's one of my secret weapons. It makes the mix extra tasty and it gives it a healthy boost that only garlic can provide. Horseradish. Now, I used extra spicy, but you can use regular--whatever you like. I understand some people don't enjoy spicy as much as I do. Old Bay Seasoning. It's the bestest in the whole wide world. Now, I understand that not everyone has access to this wonderful and wild spice, but thanks to internet, hopefully you can get your hands on it. There is no bloody mary that is ever better than with Old Bay! Now if you don't want the spice, you can skip it. But I think it adds the perfect POW! Generously sprinkle in some salt and pepper. More pepper than salt, I'd say! Look at all that goodness going into our bloody mix. It's as though angels are singing and the clouds are parting and I spellbound. That's how much I love this drink. Now I have poured in my quart of tomato juice. And I'm gonna blend it up in the blender. This is the part where I turn it on and my male Border Collie gets worked up in a tizzy because he hates the noise the machine makes. He comes running the in the kitchen barking his head off at me, and I tell him to relax and he gives me a "woof!" and runs out. Honestly, if this exchange between my Border Collie and I didn't happen, I would feel like the mix was missing something... just sayin'. Once you've blended it, give it a taste. I, of course, thought it needed a teaspoon of some hottie hot hot sauce. You can mix your mix with three cups of Clamato--my favorite clammy tomato-y drink EVER! Mixing these two gives you the ultimate in bloody mix. Seriously. No one beats this mix. And anyone who thinks they do can take me up on the challenge. A fully mixed 56 ounces of bloody goodness!! When I make my bloody, I add to the cup a two count pour of pickle juice, a three count pour of vodka, and then I fill the glass with bloody mix. Garnish with celery and try to gulp it down in three seconds flat. Time: 10 minutes | Makes 56 ounces (almost 2 quarts) | Difficulty: EASY! 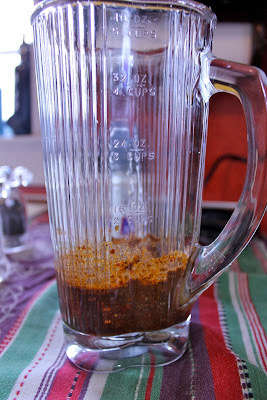 In a blender add your garlic, worcestershire, Old Bay, horseradish, red pepper flakes, ground pepper and salt. Add in your tomato or vegetable juice. Blend until mixed, 30-45 seconds. 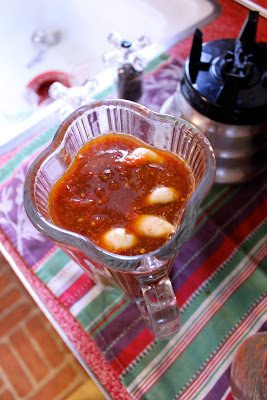 Taste and if you want a little more heat, add a teaspoon of your favorite hot sauce. Blend another 30 seconds. If you are satisfied with the mix, mix with vodka and enjoy. For an extra kick of bloody satisfaction, in a pitcher or other container, mix with 3 cups of Clamato. Serve with a splash of pickle juice and vodka. Garnish with a piece of celery or a pickle! Stuffed Squash For Two Recipe! Are YOU Addicted To DRAMA!? Quick Fix: Deep Fried Pickles & Ravioli! A SUPER BIG & AWESOME ANNOUNCEMENT! Cute Doggie Pics + Hoo-Rag Giveaway Winner!